Guests who have completed our nine-week program at Royal Life Centers are eligible to continue their stay with us at Royal Life Housing also know as our graduate housing. Guests re-learn accountability and responsibility by attending mandatory 12 step and house meetings, completing house chores, and paying rent. Accountability and responsibility are skills that are incredibly important for those in early recovery when preparing for independent living. Our housing arrangements at Royal Life Centers encourages the development of these skills, which help with impulse control and building self-sufficiency. Our goal is that Royal Life Housing provides a safe space for guests to return to at the end of each day. Caring, compassionate staff is always available to answer questions and provide needed support. We strive to make our housing program as comprehensive and affordable as we can to complement treatment and facilitate long-term sobriety. 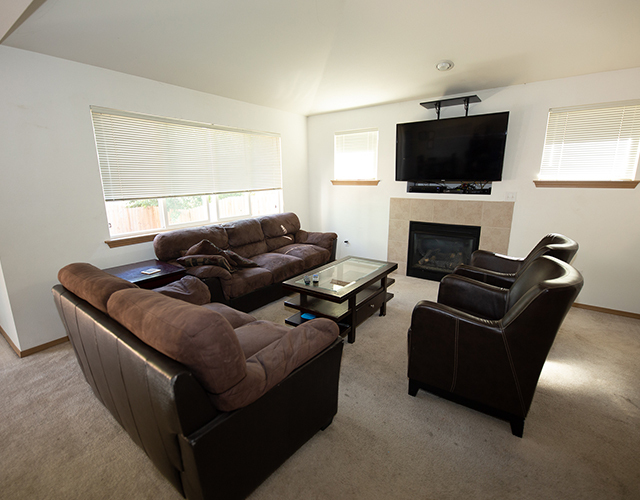 Both grad housing and regular sober living are part of our Royal Life Housing program. However, grad housing is only available to guests who have completed our nine-week program and obtained a job. Grad housing also allows for more freedom with a later nightly curfew, visitation privileges, and overnight passes. Rent during PHP, the first 3 weeks of our 9-week program, is included in a guest’s treatment plan. The second phase, or next 3-weeks of our 9-week program, is $50 per week. The final 3 weeks of our 9-week program is $75 per week. Upon successfully completing the 9-week program, as well as obtaining a job, guests can move into our graduate housing at $100 per week. Royal Life Housing at Royal Life Centers is designed to accommodate guests for as long as they would like to stay with us. Please reach out to our admissions team at (877)-RECOVERY with any questions or concerns that you have.